Saturday, Sep. 22, 2018, 2 – 3:20 p.m.
Join us for the book launch of "JOHN OKADA: The Life & Rediscovered Work of the Author of NO-NO BOY" -- on the 95th anniversary of his birth, and at the library where he once worked as a reference librarian. Co-editor Frank Abe will present images from his new biography of Okada, and join contributors Shawn Wong and Stephen Sumida for a conversation moderated by Tom Ikeda of Densho. "No-No Boy", John Okada's only published novel, centers on a Japanese American who refuses to fight for the country that incarcerated him and his people in World War II and, upon release from federal prison after the war, is cast out by his divided community. In 1957, the novel faced a similar rejection until it was rediscovered and reissued in 1976 to become a celebrated classic of American literature. As a result of Okada's untimely death at age forty-seven, the author's life and other works have remained obscure. Co-sponsored by Elliott Bay Book Company, Densho, and the Wing Luke Museum. Free to the public. Books will be available for purchase and signing. Frank Abe is a journalist and producer of the PBS documentary Conscience and the Constitution. Greg Robinson is professor of history at Université du Québec a Montréal whose most recent book is The Great Unknown: Japanese American Sketches . Floyd Cheung is professor of English language and literature and American studies at Smith College and editor of early Asian American literary works by H. T. Tsiang, Sadakichi Hartmann, and others. Frank Abe is a former journalist for KIRO Newsradio and producer of the PBS documentary, "Conscience and the Constitution." Novelist Shawn Wong contributed the chapter, "Republishing and Teaching NO-NO BOY." Professor Stephen Sumida contributed the chapter, "Questioning NO-NO BOY: Text, Contexts, and Subtexts." Tom Ikeda is the founding Executive Director of Densho. 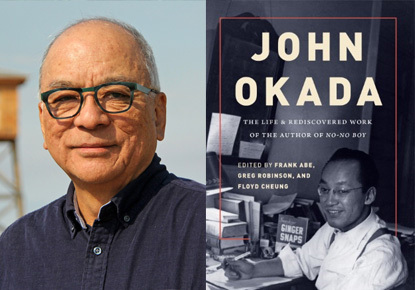 "JOHN OKADA: The Life & Rediscovered Work of the Author of NO-NO BOY"